Budget Fence and Gate Systems are proactive in working with engineers, architects and manufacturers for drawings, specifications and updates on the highest quality products along with value engineering. 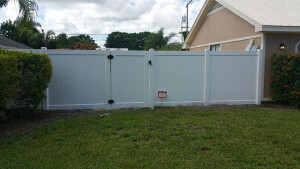 We are the leaders in the fencing industry and are proud of our reputation for quality service in South Florida. 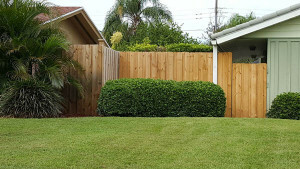 We have been serving the South Florida area for over 65 years and proudly offer creativity, quality and experience with both residential and commercial fencing installations. We have a team of project consultants who will work with you directly to create a safe, private and individualized outdoor space designed specifically for your budget and security fence requirements. Our teams are experts in project management, too. Both our production and operations managers are extremely qualified with decades of experience in the fence installation industry. We also employee an in-house scheduler who will keep you updated of your project’s progress and what to expect should there be weather or other unforeseen delays. Whether you are considering a wood fence installation, PVC, vinyl, aluminum or chain link fencing, the benefits of installing a fence around your home are many. For starters, privacy fencing is highly relevant today, as homes are being built closer and closer to one another. The right type of fencing can create a private serene environment in your back, front, or side yard areas. Security is another benefit of fencing. You can enhance the quality of your life by providing a secluded outdoor environment and safe space for your children to play. You can create areas for your pets to run safely and prevent uninvited guests and intruders from entering your property. Depending on where you live, privacy fencing can keep wildlife out. The property you purchase is an important investment and fencing will add both value and marketability to that investment. The modern fencing options from Budget Fence and Gate Systems are both decorative and practical and each style, whether it is PVC, vinyl, wood, aluminum or chain link fencing, combines functionality and aesthetics. Proper fence installation by our highly accredited fence installers helps to increase your property’s resale value. Today more and more homebuyers find a security fence a fantastic selling point when looking for a new home or commercial property and will see it as one less thing to worry about when making that purchase. Keeping your fence in good condition is essential to maintaining your property’s value. Our experienced fence installers can discuss all the latest products available that require little or no maintenance at all. Wrought iron fencing offers any property a traditional, distinguished look that can be very appealing. Used for both functionality and decoration, the variety offered by our fencing company is made from iron as well as other types of metal such as steel. A wrought iron fence can work in a variety of ways to produce a range of different styles. The caps, rails and bars are combined to form a unique package. 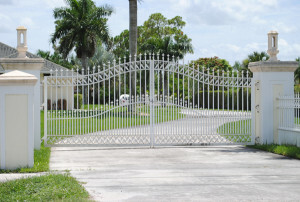 Our highly trained and certified team of in-house gate and fence installers ensure your project have only the most effective and efficient scheduling as well as top notch quality control. Two of our crew leaders have been with us for more than 40 years. Call us today for a estimate and exceptional customer service and ask us about our financing program for qualified customers.